The Trans-Pacific Partnership (TPP) Free Trade Agreement is an overly-ambitious, extremely-flawed plan that must have congressional oversight, says IAM International President Tom Buffenbarger in a recent letter to House members, urging their support of Reps. Rosa DeLauro’s (D-CT) and George Miller’s (D-CA) letter to President Obama demanding an end to the “fast track” process being used to ratify the TPP agreement. “Fast track” is a ratification process that effectively strips free trade agreements (FTAs) of congressional oversight and only requires an up or down vote for passage. 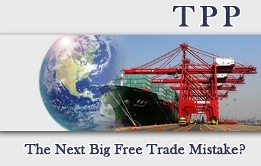 Buffenbarger describes the TPP as one of the most ambitious FTAs ever negotiated by the U.S.
Click here for a full copy of Buffenbarger’s letter, as well as the DeLauro-Miller letters to the House and president.